Ever wanted to build your own game console? DIY (do it yourself) game console. Make your own Game Boy! 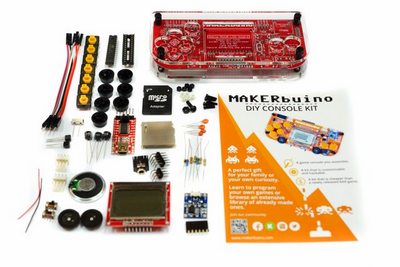 With MAKERbuino you can build your own game console from scratch! It’s assembled with ease. All of the components are easy to solder. All you need is some basic soldering skills and you’re good to go! The device is based on easy-to-find components and programmed in Arduino – one of the most popular DIY microcontroller platforms. Building the MAKERbuino is only the beginning. Program a cool retro game, add an extra analog stick, connect a GSM module, use your MAKERbuino to control a quadcopter, add a Wi-Fi module and connect it to the internet. 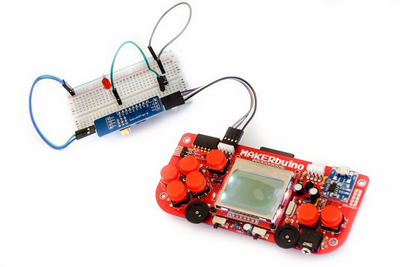 The MAKERbuino hardware and software is designed to encourage you to make new content and extensions for it. We can’t wait to see what you’ll make! Design a custom 3D printed or CNC cut casing, change the button caps, turn your MAKERbuino in a cellphone… Make your MAKERbuino unique. Throughout the process of hacking and customization, you’ll enter the world of electronics, CAD designing, 3D printing, programming, all in a fun and challenging way. Nevertheless, MAKERbuino is not only for the beginners. It’s capabilities will keep more advanced users busy as well. Based on our experience, an 11-year-old kid should be able to assemble a MAKERbuino kit with a tiny bit of help from an adult. Estimated build time: 5 hours. Building the MAKERbuino kit is just the beginning. After that, you’ll spend numerous hours creating your own games and experimenting with hardware. Kids want to have fun! MAKERbuino lets them learn different STEM skills (Science, Technology, Engineering & Mathematics) in a fun and explorative way. Thousands of kids have assembled the MAKERbuino and learned about electronics, soldering, software, hardware and so much more. We’ve designed the build guide with the purpose of teaching you something new, not only showing you how to assemble things. We’ve collected as much feedback as possible from over 1500 users and completely redesigned the build guide which we’ve now split into 6 chapters with more than 120 high-quality photos. Or you can buy a kit with a tool pack already included. 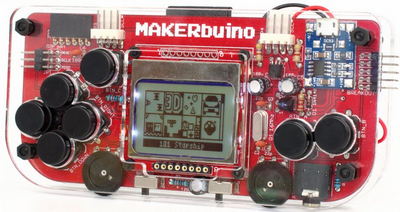 MAKERbuino comes with an SD cardthat is preloaded with numerous fun retro games. All games are open-sourceand available with a downloadable Arduino sourcecode along with a compiled .HEX file. 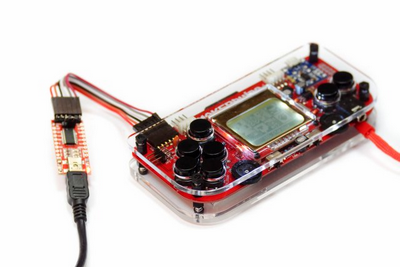 You heard it, MAKERbuino game consoles can connect with link cables, exchange data, and play multiplayer games. MAKERbuino is based on Arduino UNO. Therefore, it’s compatible with lots of hardware expansion modules. MAKERbuino was meant to be hacked. Make your game console unique. Change the button caps, craft or 3D print a custom casing, add new modules etc. MAKERbuino is based on ATmgea328p-pu – the same chip used on Arduino UNO board. Therefore, it’sprogrammed in Arduino IDE(based on C/C++) – the most popular programming environment for makers. MAKERbuino’s software is fully open-source and available for you to download. 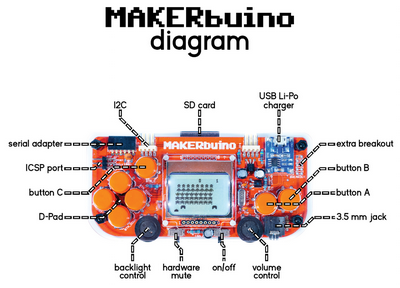 MAKERbuino’s hardware’s schematics along with the bill of materials are also open-source and available online.